I was shy as a kid. As a child I remember one thing, art always brought me out of my shell, which is why I find it to be so important in the classroom. I see it when my students are doing a craft or an art project. They begin to have conversations with one another that only happen during art. The kids that rarely talk begin to let loose and show everyone they have a voice. This past Valentine's week my students used their knowledge of blending colors from dark to light to create their own masterpiece! Their hearts were just beautiful. I wanted to keep them and hang them up, but they really wanted to take them home. And so they did. I just hope they didn't end up crushed in their backpacks. To make the hearts I drew a heart template with small boxes throughout and copied onto white construction paper. Using their oil pastels the students chose three colors at a time and put them in order from dark to light. They chose one box and began coloring with the darkest shade. Next the students colored using the middle shade. Finally the students used the lightest shade to complete the box. It's amazing what kids can do when you let them try. January is almost over and now to the month of love, Mondays off, and a freebie! 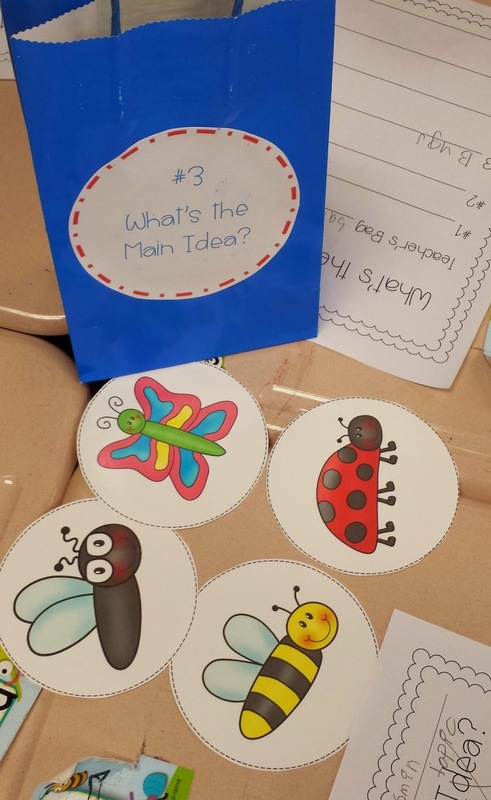 This Valentine ELA Freebie has fun independent activities. . . compound words, nouns, verbs, shades of meaning, and alphabetical order. I hope you find it useful! 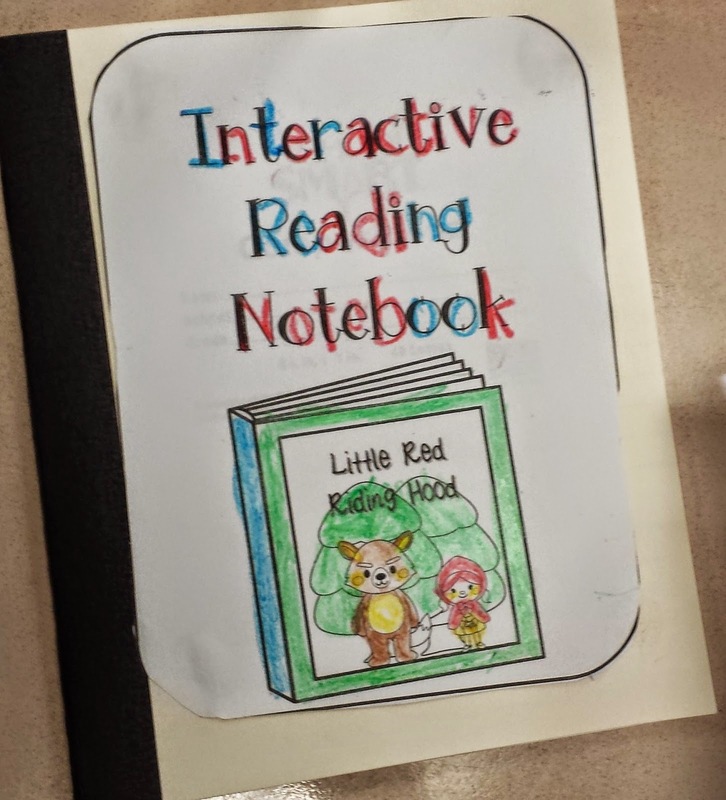 I recently introduced another interactive notebook to my class. 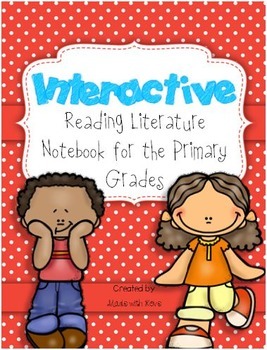 We use the writing notebook, the math notebook, the grammar notebook, and now. . .the reading literature notebook. I thought my kids would moan because that's what kids do when something is repetitive. Even something I would think they enjoy. They just get sick of the same thing over and over again. Sometimes I think they moan just for the sake of moaning. Have you ever had your kids copy something from the board and you have them erase a word and change it? They moan. You would think you had them throw away their papers, start over, and rewrite a ten page essay. Really all you've done is have them change a to the. We just used a simple school journal. So, like I said, I told my students we would start a new notebook and they cheered! Whew! This handy-dandy notebook has been pretty handy. The Common Core standards can look pretty complex, but the kids are handling them very well. At the moment we are working on comparing and contrasting two versions of the same story. Two versions of the same story. Armadilly Chili is one of my favorites. The illustrations are beautiful. With our notebooks, we are comparing and contrasting the characters, setting, plot, and central message. Here the students completed a notebook page for both The Little Red Hen and Armadilly Chili. Using that information, they completed a Venn diagram. My favorite part is the Central Message cake. This notebook page includes common central messages. After reading a story, the kids take out their notebooks and look through the candles to find the central message of the story. I'm going to be honest, I had trouble determining the central message of a story as an adult. When I hear kids discussing this, I'm amazed. So the kids are happy because they think we're doing crafts and I am happy because they sound like high schoolers. Interactive notebooks have to be the best thing since sliced bread. 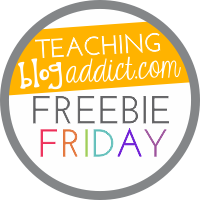 I'm linking up with Teaching Blog Addict to give you this Proper Noun Freebie. I hope you find it useful! 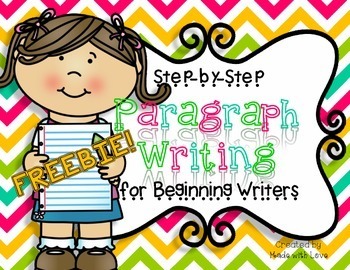 Let's get started with the freebie! Winter fun, winter freebie! There have been so many great things going on in our classroom. There was one year I became so obsessed with penguins in the classroom that I had to make my way to Sea World San Diego just to sit in the Penguin Encounter area and stare at all of the penguins I. . .my students. . .had learned about. This year, however, my obsession wasn't as strong. We had gingerbread going on at the same time and I can't obsess over both. So to get things started, I introduced my students to the research report. In the past, I've had students write their own reports, but this year I read the Common Core standard very, very carefully--students will participate in SHARED research and writing projects. Great! We were going to do this together and we had so much fun! Students used iPads to research penguin facts. Research reports complete and hung on the writing wall. Using Crayola Model Magic to make penguins. Painting our penguins. They turned out great! This year I wrote a grant through Donors Choose to receive art supplies. My grant was funded and we have been having a blast! As you can see in the pictures above, there isn't a ridiculous amount of wasted paint around the penguins. Well, that's been part of the art lessons--how to use the art supplies. We received watercolors, temperas, clay, oil pastels, chalk, colored pencils, markers, and 8-Note bells for music. I know, this may not sound like a "favorite thing," but it so is! My students can whip out a paragraph as fast as they can tattle on a kid for crowding in line. But not just any paragraph. 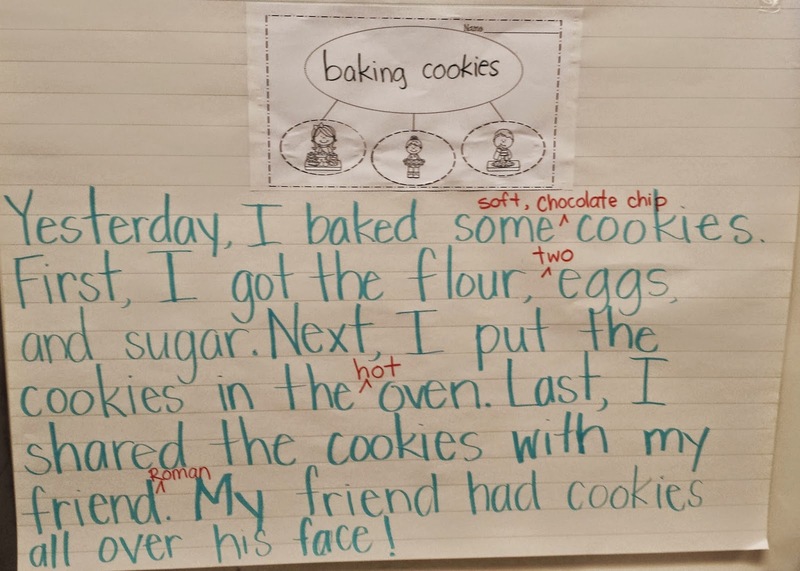 A paragraph with a topic sentence, details, temporal words, and a conclusion. They are doing so well, I had to think up something to add a little incentive for awesome writing. And that's when the Pirate Award was born. The award actually changes. It can be the Snowman Award, the Gingerbread Award, really the award is based on whatever topic we're writing on. Since the kids have been writing on about 2 topics a week, I had to spice it up. The awards are based on the ideas and creativity put into the writing. As long as I know what it says, I'm excited to read it. Needless to say, my favorite things are just that because of the enjoyment my students get out of them. I've said it before and I'll say it again, I love teaching kids to write. This past week I taught my kids the term main topic, which I was having trouble with because I'm used to main idea. The Common Core uses topic instead of idea. I'm getting used to it. Because they're second graders, I needed to get their attention. And so I did. . . with gift bags. There were only six and I think the kids were confused by who would be getting one. Little did they know there weren't gifts in the bags. Unless you consider knowledge a gift. In that case, they all received the gift of knowledge. 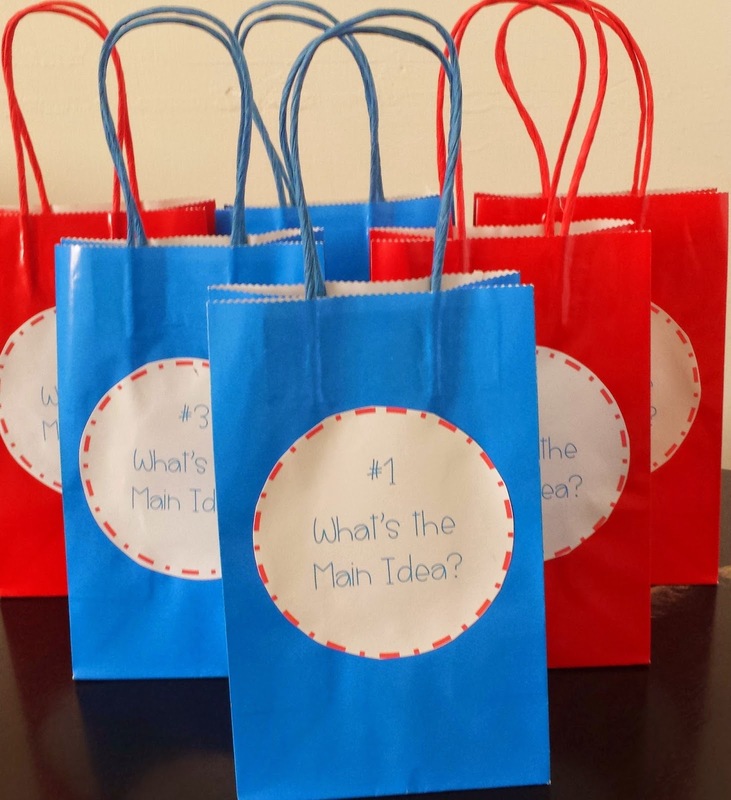 The bags do say Main Idea, but have since been fixed. Inside each bag were some picture. We'll call these details. The pictures all had something in common and it was up to the kids to figure this out. We called this the main topic. Many of the main topics were the same, but some of the kids thought outside of the box and came up with more creative main topics. It was all good to me. 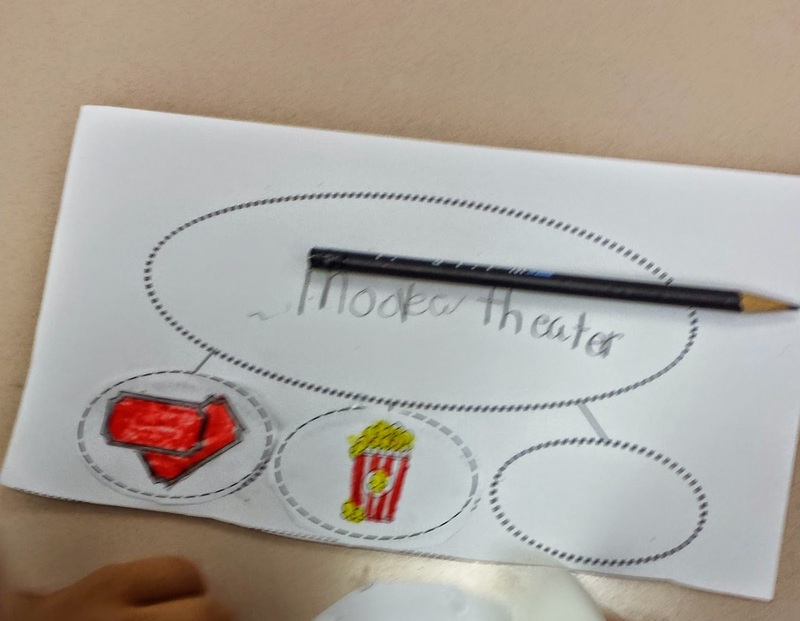 After the group activity, each student was given a worksheet with a graphic organizer on it. From this day forward, they will be seeing this almost daily in my classroom. I find this web to be so useful for so many different subjects. Much like the gift bag activity, the kids looked at some pictures and had to identify the main topic of the picture. 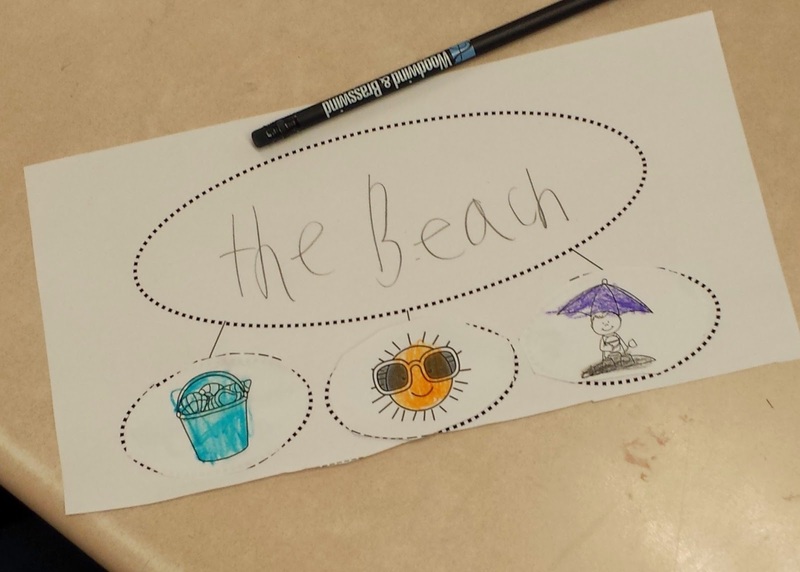 This particular worksheet had the beach as its topic. Here is the movie theater. 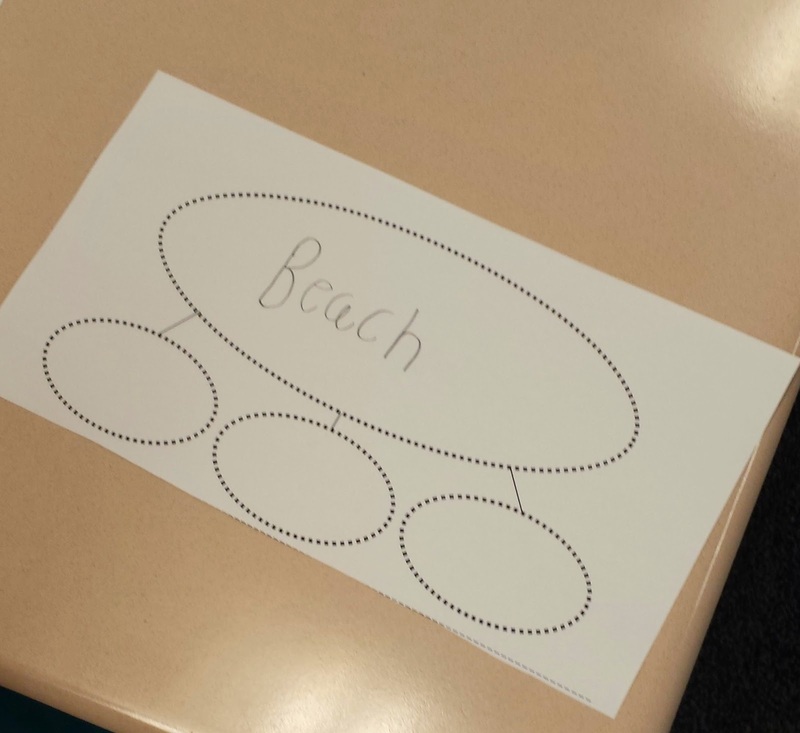 The kids were getting the hang of this whole concept so we used the graphic organizer to begin writing paragraphs. We wrote the first two together then they were given ten extra minutes to add more details to their paragraphs to make them more interesting. They had such a great time and felt so proud of their writing. Now most of them are writing paragraphs on their own. They are so excited to share. 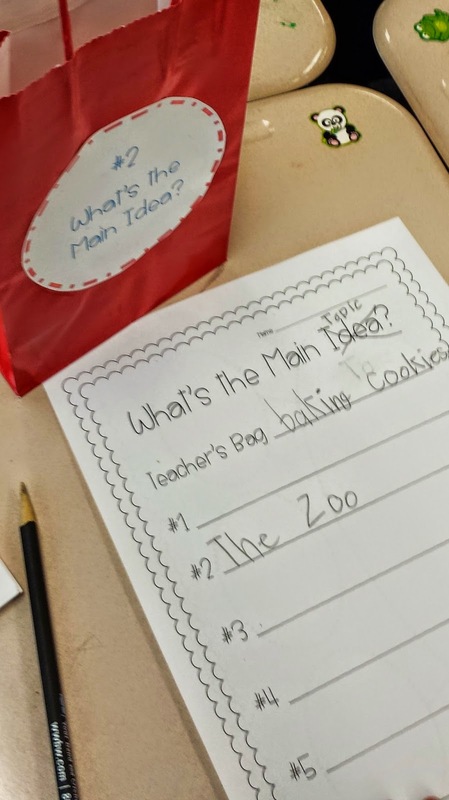 Each time they see me pull out a Main Topic Worksheet, I hear the "Yes! "es throughout the classroom. Once again, mission accomplished! 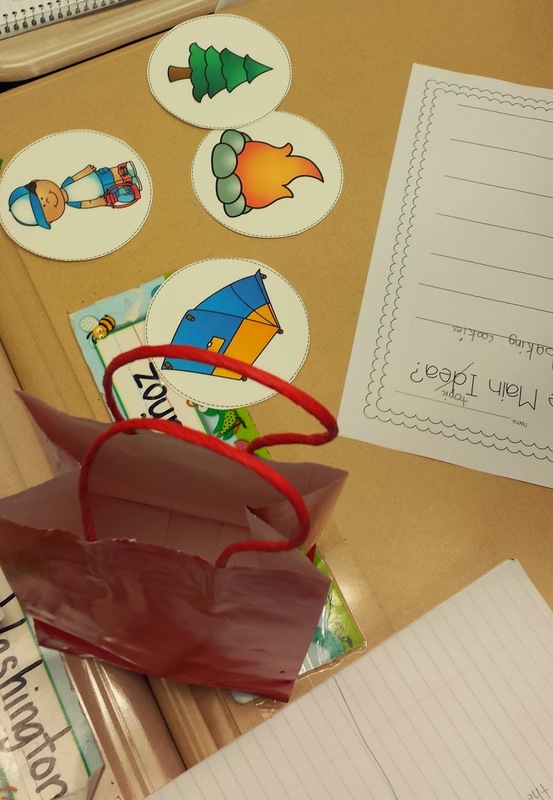 I'm linking up with Learning Lessons with Mrs. Labrasciano for a holiday linky party. This is my favorite time of year. When I think of cold weather, I think of a little brown cookie we call the gingerbread man. 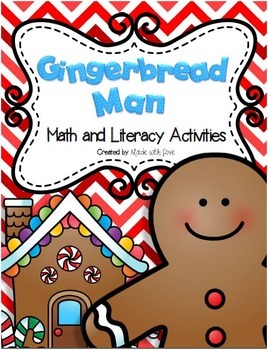 I pull out every version of the gingerbread man book I own and try really hard not to read them all at once. There's something about these stories that make my school year complete. After hearing so many stories, the students become pretty familiar with the structure of this story. 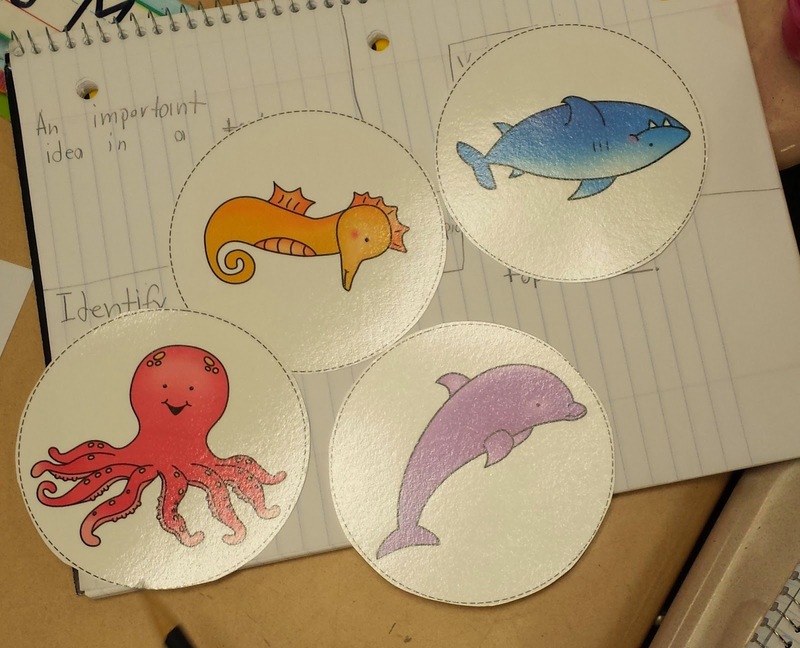 The kids identify the characters, setting, plot, and refrain of the stories. 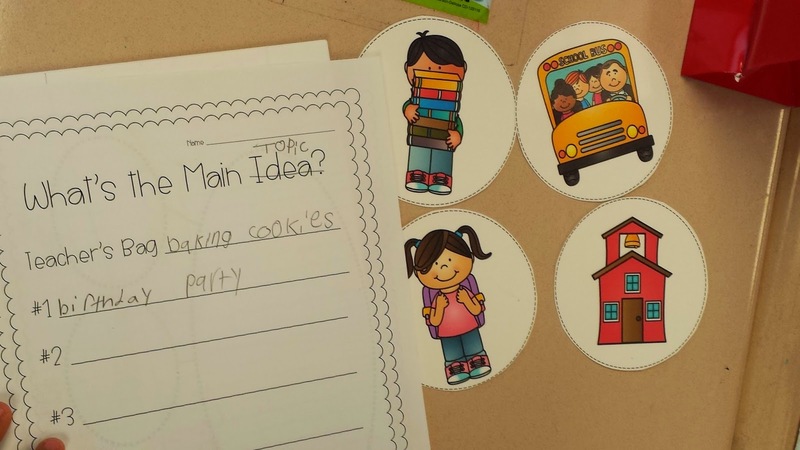 After these activities, the kiddos are ready to write their own stories. The repetition of the stories and the refrains make story writing easy and predictable for young writers. The words will just flow, which makes them feel successful. You can get the fun here! The Gingerbread fun would not be complete without some cookies and gingerbread house making!